Remove all dark green outer leaves from the artichokes. Using a serrated knife, cut off the remaining leaves ½ “ above the heart. Using a paring knife, remove the layer of dark green from the stem and base of the heart. Cut the artichoke into quarters and remove the furry centers. As you trim the artichokes, place them in cold water to which the juice of 1 lemon has been added. Blanch the artichokes in salted water until tender when pierced with a fork. Remove them from the water and let them cool to room temperature. 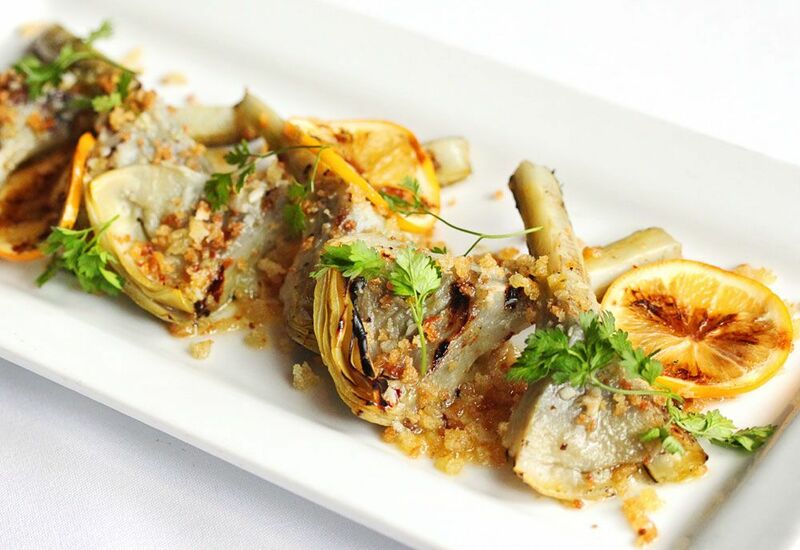 At this point the artichokes can be tossed with olive oil, salt, and pepper and roasted in the oven or cooked on a charcoal grill. Place the butter and olive oil in a small saucepan over low heat. Add the garlic, anchovy, and chile flakes and gently stir until the anchovy melts into the olive oil mixture. Transfer the hot artichokes to a platter and spoon the garlic sauce over them.